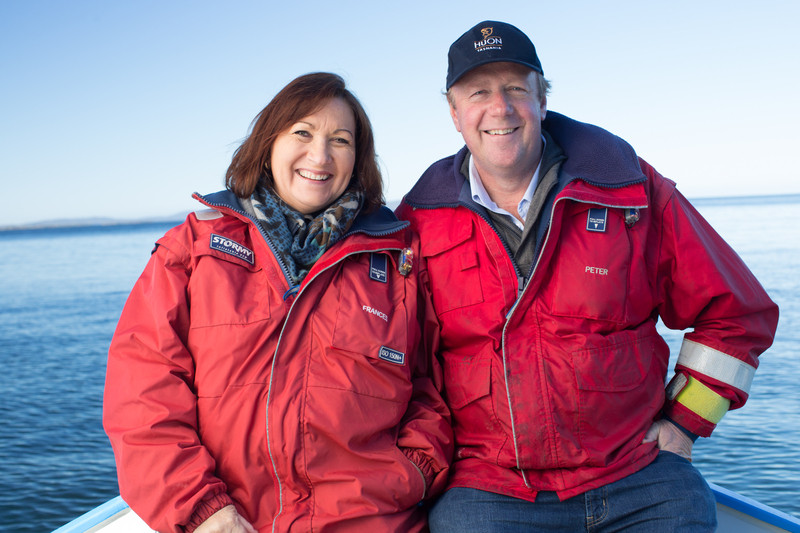 IT’S THE news Huon Aquaculture Co-Founders Peter and Frances Bender have been waiting 32 years for. They’ve been jointly named 2018 Farmer of the Year, the country’s most prestigious award for land, or in this case, sea based farmers. It’s the first time in the award’s history that a salmon farmer has taken out the title. Just over three decades ago Peter and Frances diversified from the family’s cattle business and put their first first pen to sea. Where it all started. 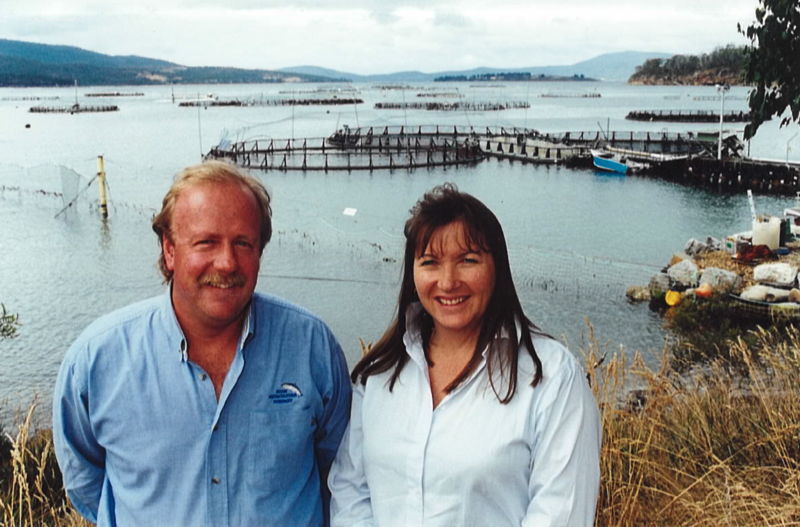 Huon Aquaculture Co-Founders Peter and Frances Bender at Hideaway Bay. The setting was the picturesque D’Entrecasteaux Channel in Tasmania’s Huon Valley, and it still is today. Huon’s base of operations is still in the very spot the pair started farming, while Huon’s stock now resides in patented Fortress Pens further offshore. Starting with one pen, a dinghy and two employees feeding fish by hand, Huon Aquaculture is now the largest majority family-owned and operated salmon producer in Australia and directly employs over 600 people. Huon CEO and Co-Founder Peter Bender said the business has come a long way over the last 32-years and he was excited to see the company grow from strength to strength. “A lot of people don’t realise how technologically innovative fish farming is and we’re proud to be leading the world in developing and using cutting-edge technology such as our fortress pens, our remote feeding systems and our well-boat, the Ronja Huon,” he said. Huon Aquaculture is now the largest majority family-owned and operated salmon producer in Australia and directly employs over 600 people. Peter credited his deep business understanding to having built Huon from the ground-up with Frances. “We are proud to have built a business that has a positive reputation, provides meaningful employment opportunities to people living and working in rural areas of Australia, and contributes to Tasmania’s economic success,” he said. The FOTY judges commended Peter and Frances for the hands-on role they have within the company, their business understanding, and the impact of the business. “We are proud to have built a business that has a positive reputation, provides meaningful employment opportunities to people living and working in rural areas of Australia, and contributes to Tasmania’s economic success,” Peter said. Judges also acknowledged their high level of innovation and the greater good work Peter and Frances are doing outside the business, and in the community. Want to taste what all the fuss is about? You can shop online and have Huon Salmon delivered straight to your door! Click here. To find your nearest Huon Salmon stockist click here.